There is no sharp distinction between science and religion and atheism itself rests on blind faith. "God has left the universe in a state for faith in this age of reason"
In 2006, the noted British ethologist Richard Dawkins published his swashbuckling bestseller, The God Delusion. With content as provocative as its title, this book attempted to show that God is a bronze-age civilisation holdover that has no place in the mind of the modern man. The book came at a most opportune time and led to a plethora of other atheism books designed along the same line, so that popular authors like Christopher Hitchens, Sam Harris and Daniel Dennett (called "the Four Horsemen of Atheism") churned out books against religion one after another. These atheism books were distinguished from their predecessors by their rhetorical, propagandic content, full of provocative barbs and tirades designed to elicit the most outlandish response attempting to bully the reader's intellect into accepting that the concept of God is outdated, and religions are the root of all evils. The underlying theme of all these works is the proposition that modern science has shown a universe without God or any supernatural entity; therefore, God or anything similar does not exist. As Dawkins himself put it, "Darwin has made it possible to be an intellectually-fulfilled atheist". These Four Horsemen have made atheism the new fad which every thinking person is supposed to capitulate into. All the more so since the response from the faithful (called "apologists") has been rather tepid; and that, while their arguments lack substance, the popular appeal to science as the source of all our knowledge and authority, and religion as the equivalent of a vestigial organ, made an irresistible impression on millions. Today, it may well be the case that most lay atheists in Britain in particular, and the Anglophone world in general, owe their atheism, directly or indirectly, to these Four Horsemen. Another story they spectacularly succeeded in selling to the public is that all religions are based on faith without evidence (that is, blind faith), while atheism is based on science and reason. But is that so? Is it truly the case that religion is blind faith while atheism is not? Has modern science, indeed, really done away with God? Way back in the 19th century, when Napoleon's chief scientific advisor, Laplace, explained his nebular hypothesis, and the emperor noticed the lack of God in his new theory of the cosmos, Laplace simply replied, "I have no need of the God hypothesis". But is God really a scientific hypothesis in the first place? Victor Stenger, at the height of the atheism resurgence in 2007, himself published the book grandiosely titled, God: The Failed Hypothesis. In it, he argued that God must be treated like any other scientific hypothesis, and furthermore, that when seen in this light, it is a failed hypothesis that does not stand up to scientific scrutiny. 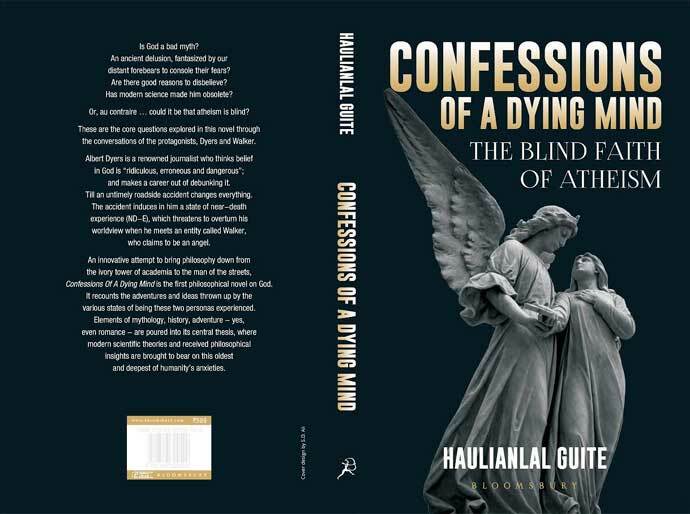 Enter Haulianlal Guite, and his new book Confessions Of A Dying Mind: The Blind Faith of Atheism. Confessions of a Dying Mind: The Blind Faith of Atheism; Bloomsbury; Rs 599. The latest to join this perennial conversation on the ultimate nature of being, this rising philosopher from the most unlikely place, has published a work that attempts to undermine the narrative championed by the Four Horsemen and their acolytes. Where atheists like Dawkins appeal to science to allege that God is nothing but a prehistoric delusion, Guite in this new book uses the same scientific data to show how science is an enterprise that is monumentally irrelevant to the God question. Where attempts have been made to portray religion and science as always conflicting since the trial of Galileo in the 17th century, Guite uses the same example to show how religion and science have never been in real conflict, and that the battle was never between religion and science. As he put it in the mouth of his book's protagonist, Mr Walker, "the battle between Galileo and his foes was never been science and religion, but between one philosophy of science called 'realism' and another philosophy of science called 'instrumentalism'". That is, what was at stake was never science and reason, but a particular interpretation of science. And Guite relishes in pointing out the irony of how such modern scientists like Stephen Hawking would have sided with the medieval churchmen who battled against Galileo. As for the claim that religion is based on blind faith while atheism rests on evidence, Guite marshals an impressive array of arguments and evidences from philosophy, biology and physics to show how atheism has nothing to do with science at all. By using the most significant ideas in modern philosophy - such as, Kant's Copernican Revolution, Popper's falsification and the Duhem-Quine thesis - Guite has powerfully argued that there is no sharp distinction between science and religion, and that if anything, atheism itself rests on blind faith. Thus the subtitle. By putting the shoe on the other foot, Guite argues that these eminent scientists are right about the science but wrong about the philosophy of their science, and therefore, they are fundamentally wrong to think atheism is, or can be based on science. Ergo, atheism is itself an act of faith without evidence - that is, blind faith. Regardless of whether one agrees with his conclusions, what makes Guite's book uniquely alluring is the novelised format he adopts. Written along the lines of Jostein Gaarder's outstanding bestseller, Sophie's World, but on a topic far more relevant and fascinating than Gaarder's, this new philosophical work is for non-philosophical readers who wish to enter the perennial conversation, and be initiated into philosophy. Indeed, it is billed as "the world's first philosophical novel for God", whose author is arguably the first Indian civil servant to write on philosophy since John Stuart Mill published On Liberty way back in 1858. Without deploying unnecessary jargon, Guite writes the book as a non-fiction novel, as a series of conversations, dialogues and adventures of the two main protagonists - the atheistic journalist Mr Albert Dyers who has a near-death experience; and the angelic entity Mr. Walker who appears in his experience. Woven into the plotline of the novel itself is the central contention of the book: that, whether he believes in the reality or unreality of the near-death experience, Dyers does so on blind faith. Is the topic of God of an interest to you? If so, this is what Dr CK Mathew, former chief secretary of Rajasthan and visiting professor at Azim Premji University, and himself an unbeliever no less, has this to say in the book's foreword: "a masterpiece ... pick it up then, and read it. It will change your mind, and the way you think!" Also read: Can I be a Hindu and still an atheist? The writer is an IAS officer from Manipur and the author of 'Confessions Of A Dying Mind: The Blind Faith of Atheism'.